Fast-food restaurants can supersize French fries and drinks, but Mother Nature has found a way to supersize a type of apple. Peter Hirst, a Purdue University associate professor of horticulture, found that an anomaly in some Gala apple trees causes some apples to grow much larger than others because cells aren't splitting. The findings, reported in the current issue of the Journal of Experimental Botany, showed that the new variety, called Grand Gala, is about 38 percent heavier and has a diameter 15 percent larger than regular Galas. "It's never been found in apples before," Hirst said. "This is an oddball phenomenon in the apple world." Hirst is trying to understand what causes the difference in the size of apples - for instance, why Gala apples are so much larger than crabapples. "There is real incentive for fruit growers to increase the size of their apples," Hirst said. "At 125 apples per bushel, a grower gets 8 cents per apple. But if they have larger apples - 88 per bushel - the price more than doubles." 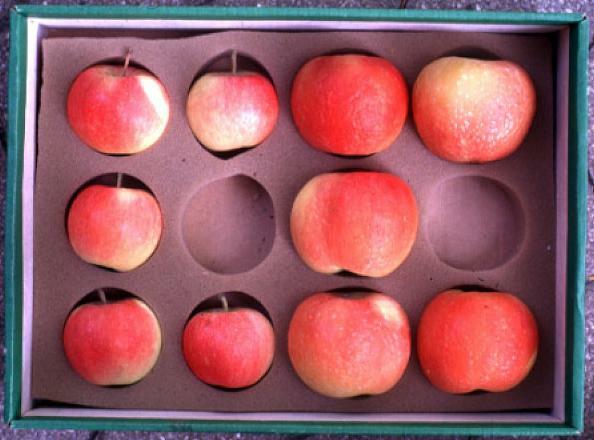 Since different apple varieties don't always have the same genes controlling the same functions, comparing Galas to crabapples isn't an easy way to understand the mechanisms that control their destined sizes. But the Grand Gala seemed like it might provide an opportunity to unravel the mystery. "The way the Grand Gala was found was that someone in an orchard full of Gala trees noticed that one branch had different-sized apples than the rest of the tree. They grafted new trees from this branch to started a new tree," Hirst said. "These are just chance events." Larger apples tend to have more cells than their smaller counterparts, so Hirst theorized that there was a gene or genes that kept cell division turned on in Grand Gala. Instead, he found that Grand Gala had about the same number of cells as a regular Gala, but those cells were larger. Normally, cells make a copy of their DNA, grow and then split. Each of those cells continues the process. Through a phenomenon called endoreduplication, the cells in Grand Gala make copies of their DNA, but don't divide. Instead, the cells grow, add more copies of the DNA and continue that growth. The Grand Gala fruit has the same core size, so the added size and weight is in the meat, or cortex, of the fruit. Hirst said they're also crunchier and tend to taste better. Hirst's study found that one or more of a handful of genes is likely responsible for the endoreduplication. And while it may be possible to isolate those genes and find ways to increase the size of other apples, Hirst said it's unlikely. "You won't see Grand Galas in the grocery store," Hirst said. "Consumers like shiny, perfect-looking apples. Grand Galas are slightly lopsided. They're good eating apples, but the end product isn't something that consumers are used to seeing at the store." He said the apples are likely to gain more of a following at apple orchards where they're grown. Hirst will continue studying what causes different apples to be different sizes, but he won't pursue endoreduplication as an answer, he said. Purdue University funded his research. SCIENCE HISTORIAN CRACKS "THE PLATO CODE"